Imitation is supposedly a fundamental mechanism for humans to learn new actions and to gain knowledge about another’s intentions. The basis of this behavior seems to be a direct influencing of the motor system by the perceptual system, affording fast, selective enhancement of a motor response already in the repertoire (response facilitation) as well as learning and delayed reproduction of new actions (true imitation). 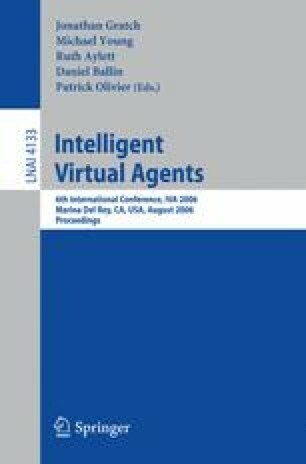 In this paper, we present an approach to attain these capabilities in virtual embodied agents. Building upon a computational motor control model, our approach connects visual representations of observed hand and arm movements to graph-based representations of motor commands. Forward and inverse models are employed to allow for both fast mimicking responses as well as imitation learning.